Dr Abdul Khan has outstanding skill and is eminent in the field of dental implantology, oral surgery and oral rehabilitation. He has refined many surgical techniques and introduced innovative solutions in surgical aspects of implant dentistry. 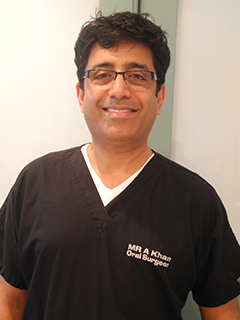 Dr Khan has 16 years experience in the field of oral surgery at Imperial College London, where he conducted out-patient clinics and performed surgery under general anaesthesia. All general anaesthetic lists for oral surgery at Imperial College London were carried out by Dr Khan. He has unique training in both restorative and implant dentistry at the highest level. He has been invited to speak at international implant meetings and seminars, and has organised and taught on various implant courses. Dr Khan has also been published in international journals including the International Journal of Endodontics and Journal of American Dental Association. He is currently working on a book on full mouth implant rehabilitation. He joined the team at Ravenscourt Dental Practice in 2000, and has provided his skills and expertise to many patients here. He also presents Study Clubs @ Ravenscourt, events offering Continuous Professional Development to colleagues in the dental community. Away from work, he enjoys spending time with his family and playing cricket.